Today is the official release of the pre-announced ‘Joomla Vortex’ template. There are several attractive new characteristics added to the template that distinguish it from the other free Joomla templates offered on the Themza website. With the Vortex Multi-colour Joomla template we are coming very closer to the professional Joomla templates that costs money… and yet, this is not our final word! 1. This is our best Joomla template so far and you have the possibility to choose between 5 different design color schemes: red (default), blue, green, brown and black. To make use of the color theme change functionality you have to ensure first that the params.ini file, which is a part of the template archive, has permissions for writing on the server. To enable this through FTP, you must click on the remote file with the right mouse button, select Set Permissions or Change Attributes from the context menu and specify the corresponding write permissions. For the majority of servers 0775 would be OK, but some servers also require 0777. After you have successfully done these settings, you need to go to Extensions->Template Manager in the Joomla Administration panel, click on the template and change the Color Variation from the select box in the Parameters section. 2. Unlike our older Joomla templates, here you have Grey footer area divided to two pre-defined sections – USER 1 and USER 2 (those are contained by default in the Joomla script). These sections you can use to post Latest News, Archive, Polls, etc. Until now, this had been possible only in the left column of the template. 3. Also new is the default TOP area, containing (by default) the Newsflash1 module, which will be shuffling news information, but can be replace with custom module, which can present, for example, some welcoming text. The module is located at the top of the banner, the font is white colour. For the moment we are trying to stick to the default areas integrated in the Joomla script, we plan to create our unique areas shortly, which will be available to the users, as long as they re-create them in their control panels. Our newest template will have almost the same characteristics, with one new area added – Right column. 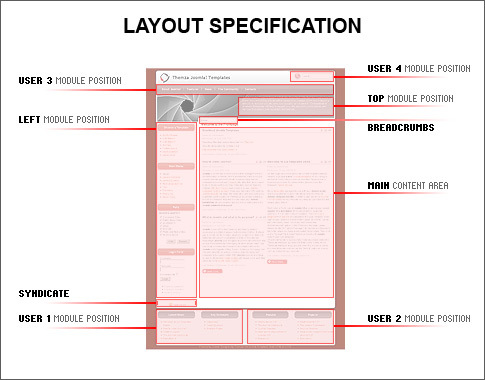 The development of this template is almost completed and we will present it to your attention shortly. This entry was posted on Sunday, August 3rd, 2008 at 9:28 am	and is filed under Joomla 1.5.x. You can follow any responses to this entry through the RSS 2.0 feed. You can leave a response, or trackback from your own site. Hello Barbara and welcome to the Themza blog community! The Joomla Vortex template does support the modules you are interested in, so could you please check in your Joomla Admin Panel whether those modules are active or not. It is possible that you have switched them off by mistake. You can do this by going to Extensions > Module Manager and checking the status of the modules that you do not currently see in your Vortex template. You could also check the “Position” of those modules and compare them to the Vortex scheme that you can see on our website. To visualize our instructions, we have sent you a screenshot via e-mail. I installed this template and It’s working fine. Today I installed metadod (http://www.brandonitconsulting.co.uk/mod_metamod/) and it shifted my menus to the left… Any solutions to that problem? In metamod I defined the style as “rounded”. Could you please send us a link to your website where the template is installed, since we need to check the menu problem out on our end. The link we have only leads us to the installed module itself. I need to edit or delete content module top position, especially those are contained by default in the Joomla script as I do that? 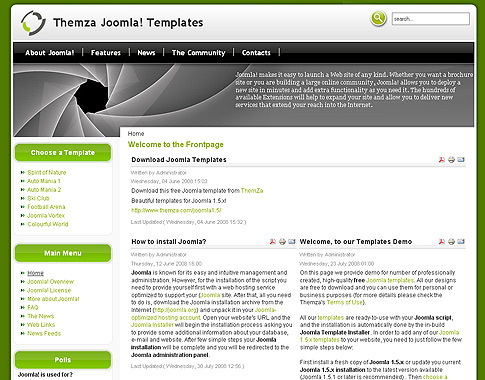 Hello, Themza Team, thank you for this template, it is really wonderful. My question is about Contacts Component in Joomla. The trouble is – when I add an image on contact page in the IE and Opera the table scretches on the full width of the page and the image is on the right. But in the Mozilla Firefox the image is directly after the information about my company and the image is on the left. Could you help me to fix it?